This graph depicts the average ticket price of all National Basketball Association teams in the 2015/16 season. The average ticket price for a Milwaukee Bucks home game was at 50.30 U.S. dollars in the 2015/16 season. The National Basketball Association (NBA) is a North American professional basketball league with 29 teams in the United States and one in Canada. The combined revenue of all NBA teams amounted to about 5.9 billion U.S. dollars in the 2015/16 season – 25 percent of this total was generated by regular season ticketing. For the last few seasons, NBA home games brought an average of over 17 thousand people to NBA arenas. The 2016/17 season established a new record for the league in terms of attendance, with an average of 17,884 attendees. Regular season tickets for the 2015/16 season cost 55.88 U.S. dollars on average, the highest figure to date. 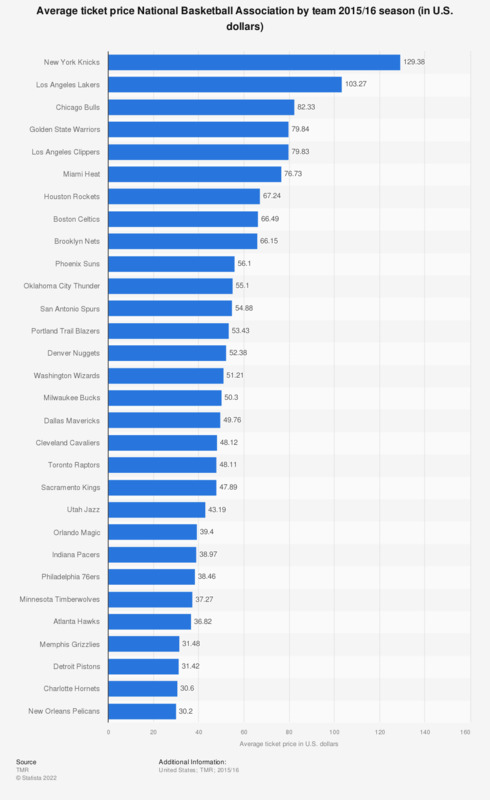 The New York Knicks is the franchise that charges the most for its tickets, followed by the Los Angeles Lakers. The average ticket price for a Knicks game stands at more than 129 U.S. dollars, while tickets to Lakers games cost just over a hundred U.S. dollars. With an average price of 30.2 U.S. dollars, tickets for New Orleans Pelicans games are the least expensive in the league. Compared to the other major North American sports leagues, tickets for NBA games are more expensive than tickets for Major League Baseball (MBL) games, but less expensive than tickets for National Hockey League (NHL) games and National Football League (NFL) games. Of the major sports leagues in the North America, the NFL has the most expensive tickets, with an average ticket price of almost 93 U.S. dollars per game in the 2015/16 season.